Memory efficiency — a single instance of the world is used (if an external solution is used, one more copy of the world has to be created and stored). Performance — calls to external functions, excessive data conversion and transmission between integrated systems are avoided. It should be clear that it is not a high-precision simulation of real world physics! The simulation is just an approximation based on simplified calculations and decreased accuracy providing a realistic look within the strict limits of the real-time mode. Achieving a true-to-life result always involves a trade-off between accuracy and performance. It is not recommended to use real values of mass, density, gravity, etc. To ensure realistic behavior, the values are to be chosen experimentally. Though in general Unigine uses a simplified Newtonian physics with an impulse-based approach, the integration of collision detection, gravity, friction, buoyancy, joints, and external physical forces provides realistic simulation of physical bodies and complex interactions between them. When a problem cannot be solved by means of the built-in physics module or takes too much time, several other approaches can be used: bone-based animation, hard coding, or using an external physics engine. Meshes and animation can be created using third-party graphics software (3ds Max, Maya, etc.) converted to the Unigine native format (.mesh and .anim) by means of corresponding plugins and then used in the world. The first use case is creation of a complex mechanism with a large number of various joints working in the background of a factory workshop. Simulation of this mechanism using physics will significantly reduce performance. You can use a baked bone-based animation instead. The second use case is determined by the fact that bones cannot be affected physically. Imagine that we have an antenna, which is represented by a single mesh containing a number of bones, attached to a vehicle. To make it move realistically we have to write a script (in Unigine script, C++ or C#) calculating necessary bone transformations and providing desired behavior of the antenna. The first use case is simulation of the object deformation as a result of an inelastic collision. The built-in physics does not implement inelastic collision simulation. However, we can detect a collision and then change the deformed object's mesh in the script (in Unigine script, C++ or C#) providing the desired deformation. The second use case is when there is a large number of interacting elements, e.g. tank tracks and suspension. If we have many tanks, the calculation of physics will drop FPS down. Moreover, due to approximation errors the whole mechanism may blow up or look unnatural. We write a script, which calculates the movement of suspension and track plates, providing stability and a desired degree of realism. Using code-based tricks makes it possible to maintain acceptable FPS and tweak the behavior of objects. In cases where a precise physical simulation is required (e.g. flight dynamics, fluid dynamics, etc.) it is recommended to use a specialized third-party solution that provides required functionality. Unigine does not currently offer a solution for third-party physics integration. Therefore, all necessary product-specific guidelines on how to integrate a certain third-party solution into your application are to be obtained from the party offering this solution. Very often, the best results can be achieved using a combination of different methods or techniques. So, the approaches described above can be successfully combined to provide a convincing look and acceptable performance. 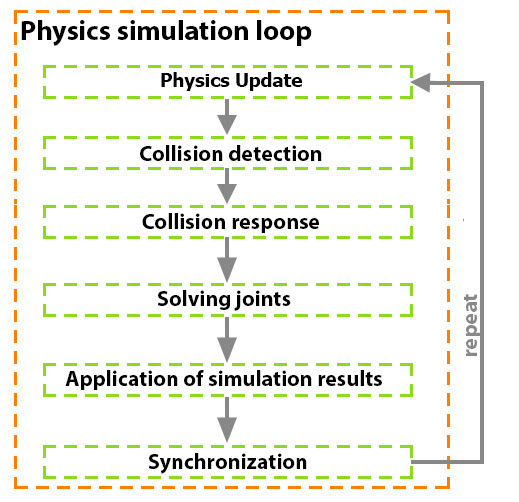 The use case illustrating a successful combination of several approaches is associated with simulation of physical destruction of complex objects, e.g. collapsing bridges, exploding buildings, etc. Realistic simulation in this case is impossible in real time. However, it can be pre-computed using third-party offline physics simulation software and then converted to a baked bone-based animation to be used in a real-time application. While the majority of node types in the scene serve as auxiliary means or decorations, the Object type can have physical properties and interact with other objects and the environment. For these properties to be assigned, the object should have a "body" (a physical approximation of the object), and the body should have at least one "shape " (a volume in space occupied by a body). To connect bodies and restrict their movement relative to each other, the "joints" are used. The picture below illustrates relationships between these entities. To interact with other objects as well as external physical forces, an object must have a body. The body can be considered a physical approximation of the object, it describes its behavior and represents a set of its dynamic parameters, such as mass, velocity, etc. 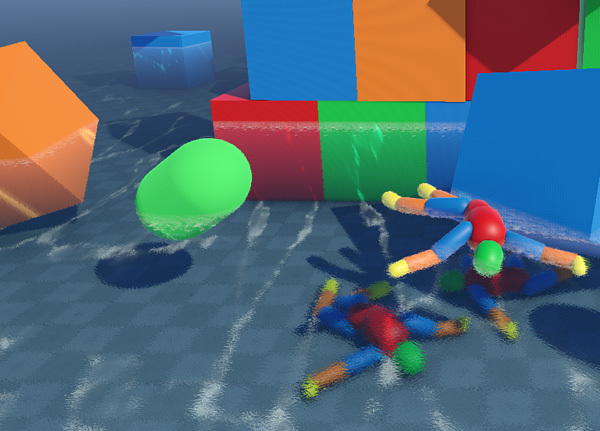 There are several types of bodies: dummy, rigid, ragdoll, fracture, rope, cloth, water, and path. 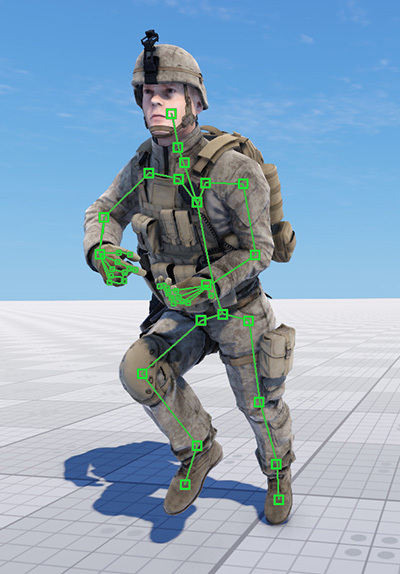 Each type of body is used for simulation of a specific type of object. 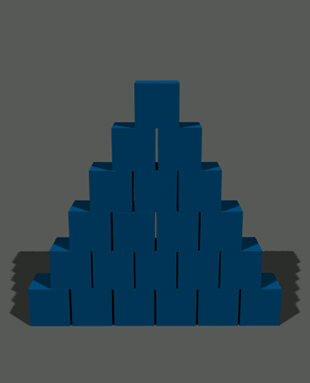 While the body determines the object’s behavior, the shape represents the volume of space occupied by a physical body. The shape is invisible and doesn’t have to be the same as the object’s mesh. Actually a rough approximation (sphere, capsule, cylinder, box, or convex hull) is often more efficient and indistinguishable. A physical body has one or several collision shapes allowing objects to collide with each other. Objects with shapes also fall down under gravity, bounce off static surfaces, or slide along them. 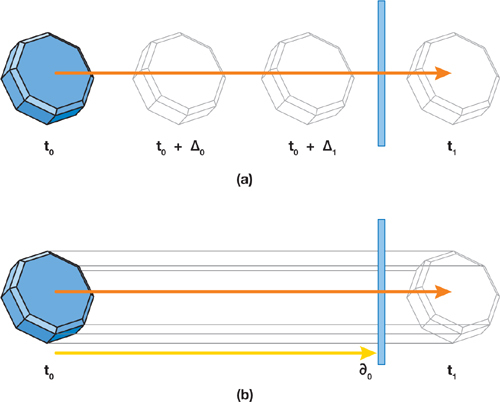 Sliding and bouncing are determined by restitution and friction coefficients included in the list of shape parameters. 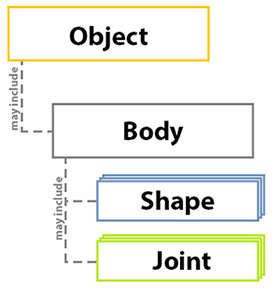 A body without a single shape assigned behaves as a dummy body that can be connected to other bodies using joints, but does not collide and is immune to gravity. In virtual worlds, like in the real world, we would like to have complex objects consisting of several interconnected parts (for example, a robotic arm or a car). That’s exactly what the joints are used for. A joint connects two rigid bodies and represents certain constraints i.e. it restricts the movement of connected bodies relative to each other. When the force applied to a joint is too much, the joint breaks. The implementation of destructible joints includes the limits of linear and angular motion, so if a force exceeds these limits, the joint is broken. There are several types of joints: fixed, hinge, ball, prismatic, cylindrical, suspension, wheel, and path. When using joints, it is very important to ensure mass balance — avoid connection of too heavy bodies to light ones, otherwise the system may become unstable. As mentioned before, physics simulation uses approximate calculations, therefore, if the difference of mass between two connected bodies is significant, accumulation of errors and precision issues lead to instability of the result. Thus, when making a car model, do not set the mass of the car body equal to 2000 kg and the wheels — to 10 kg, it might be better to use 5 kg for the body and 1 kg for each wheel to provide realistic behavior. Discrete collision detection is performed in certain intervals of time and each frame is treated separately from others. In general, discretization improves performance. However, when a project framerate is already low, a small fast-moving object is likely to teleport from one point to another instead of moving there smoothly, and a collision will not be detected. Continuous collision detection does not suffer this problem as the moving body is extruded along its trajectory (between two adjacent frames). If something gets into this volume and a collision is detected, the body is taken back in time to correct the collision reaction. To reduce computational load it is strongly recommended to use simple collision shapes instead of complex ones wherever possible. The second parameter is a number of checks to be performed — the worst case would be all-against-all. To exclude unnecessary checks (e.g. two objects hardly collide if they are far from each other) the scene is to be split into sections. 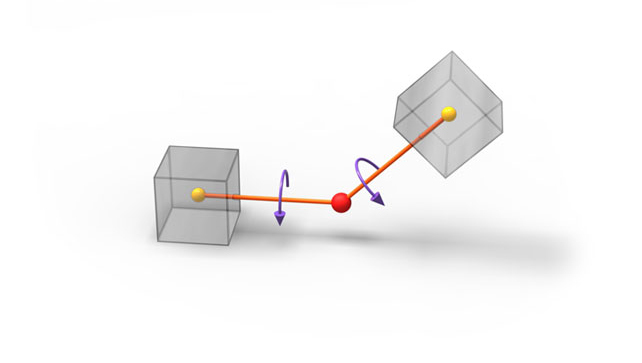 Broad phase detection is a computationally low-cost operation that quickly answers the question: Which objects have a strong possibility of colliding? Narrow phase is a computationally intense mesh-on-mesh collision detection, and thus cannot be performed on every pair of objects each frame. It answers the question: What part of object A collided with object B? There is another important step which follows collision detection — collision response, or the result of collision (e.g. two balls bounce off each other). Friction, restitution, and other parameters are taken into account in calculation of the collision response. If some surfaces of an object participate in collisions, and others don't, collision detection can be enabled on a per-surface basis. For example, a dashboard inside a cockpit, as it is covered by other surfaces. Scaling of meshes that participate in collision detection is not supported. Intersection detection lies at the heart of collision detection, but is a particular case of ray intersection (ray casting) that serves slightly different purposes. Calculation of the intersection between a ray cast from a certain point in a certain direction and a surface is fast and inexpensive and therefore sometimes can be used instead of computing a collision. For example, calculation of collisions of car wheels with the ground takes time and decreases framerate. In this case we can use intersection of rays cast from the bottom of the car with the ground instead of precise collision detection using collision shapes, thus reducing computational costs and increasing performance. To make collision and intersection detection flexible and selective, and to reduce calculation costs, the mechanism of bit masking is used. For example, we have an object that does not participate in interactions with others, but we want it to lie on the ground. Matching the collision bit masks of this object and the ground (at least one bit in the masks should match) provides the necessary effect. One object can participate in several collision and intersection checks as only one bit in the mask is required to match for a pair of objects. 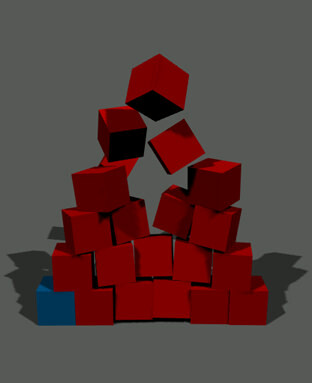 Physics is simulated with its own fixed FPS, which does not depend on the rendering framerate: a variable FPS cannot be used here because it makes calculation results unstable. When a body is moving slower than a specified minimum linear or angular velocity for a specified period (freeze frames), it is assumed that it has come to a halt. During this period of inactivity, there is actually no need to simulate it. If this happens, the object remains in a resting state until it is affected by another object or force. Therefore, such object is excluded from all steps of the simulation except collision detection. This state is called freezing and it allows to save a great deal of computational resources. If interacting objects are far away from the viewer, they do not make a noticeable contribution to the whole image and thus can be neglected. The Simulation distance setting specifies the distance from the viewer when physical interactions are no longer calculated. Global physics settings (FPS, gravity, simulation distance, freeze frames and velocities, penetration factor, penetration tolerance) can be accessed via the Physics settings panel in the Editor.